If your search does not find any results matching your criteria or you want more specific results, you can use the Advanced Search fields on the advanced search form to narrow your results. This will open a pop up form with a number of options to help you narrow your results. The first box has three options to help you narrow your search. Any word lets you look up something or something else instead. For instance, you could search "alcohol drug" the search would include services about alcohol and others about drugs. All words is your standard search box like the one on the front page. Exact phrase will return only those services that contain all words you have entered. For instance if you search “alcohol drug abuse”, the search would include only those services that have matched all three words - alcohol and drug and abuse. None of these words ensures that the words that you type in the field do not return results. This is the "unwanted words" box. This box lets you not include certain words in your search. For example, if you search for "alcohol and drug abuse services" but want to exclude results about spousal abuse you would enter the word “abuse" in this box to find services about drug and alcohol abuse and not about spousal abuse. Near to location lets you restrict the search to a specified suburb or area in Australia. 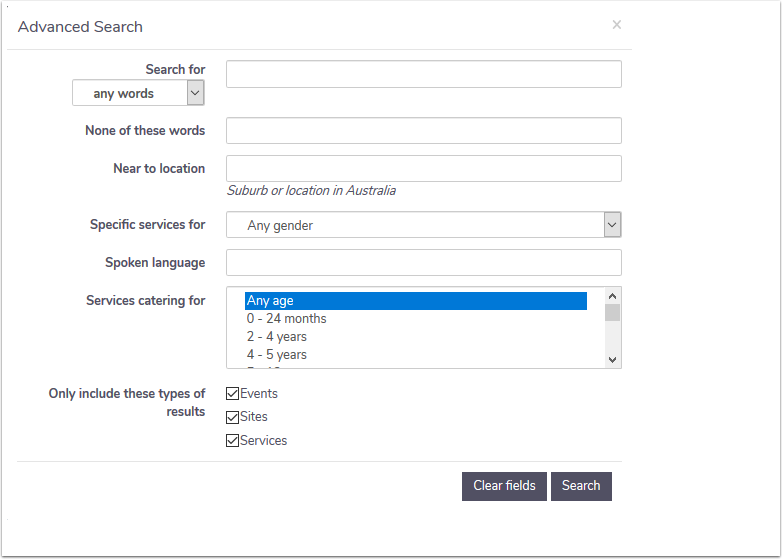 Specific services for lets you restrict the search to a specified gender. For example, if you want services for women and want to exclude services for mixed or other genders, you would select “women” from the drop-down list to find services targeted specifically to women. Spoken language lets you specify a language which must be spoken by a service provider. Entering a language here will return only those services who have specified that language in their service details. 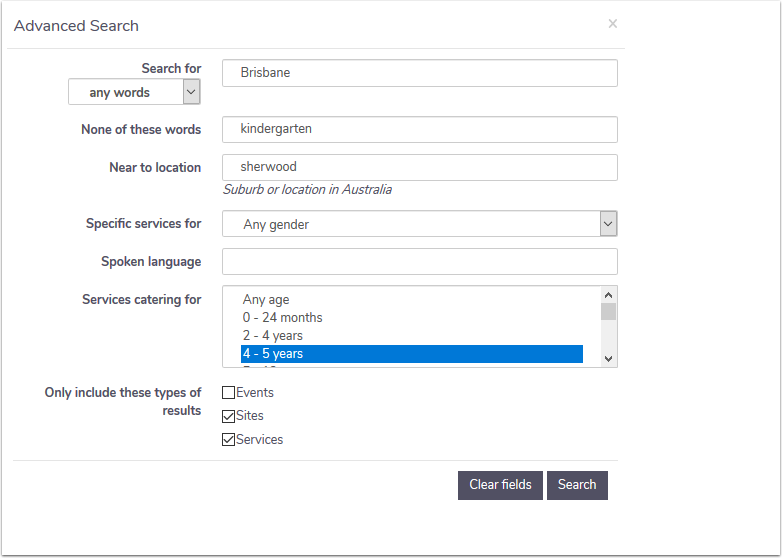 Service catering for lets you restrict results to services targeting a specific age group. 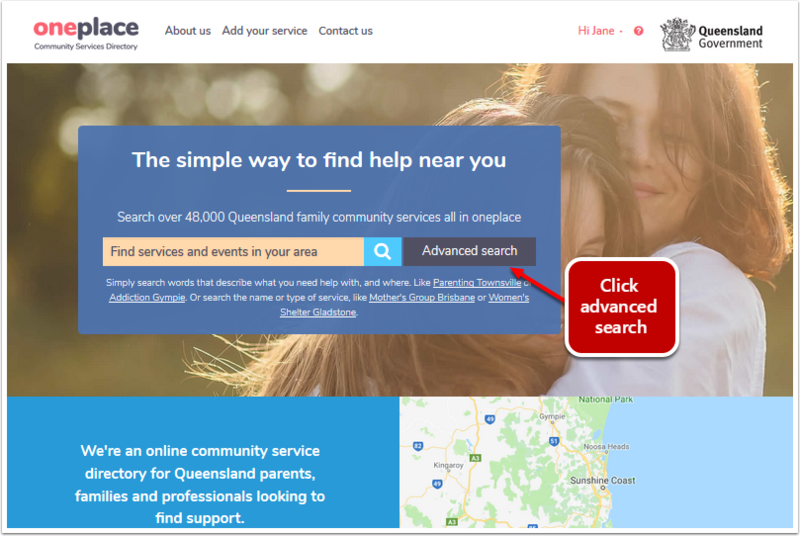 This is particularly useful when searching for services targeted to the very young or very old. Sites are agencies/organisations that may have one or more service associated with their location. For example St George Hospital has over 15 services including Allied Health Services, Palliative Care, Hospital Services, Mental Health, ENT, and so on. Services are defined as the type of service that you are searching for such as physiotherapy, child care, aged care etc. Entering criteria in each of the search boxes may return no results because the search is too narrow, or restrictive. By removing one or more of the fields in the search criteria, the search can be broadened enough to allow the system to return some results. If you get a “zero results found” message, press advanced search to return to the advanced search page. The advanced search page retains your original criteria, making it easy to modify your search. To remove all criteria from the search boxes, press clear fields located at the bottom of the form as shown below.